Engineered for small engine (RV & Marine) applications. 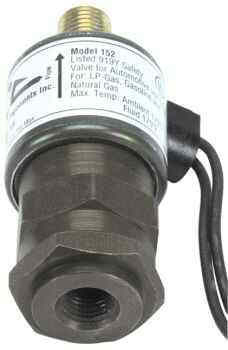 Lightweight, compact design features filter and shut-off valve in one unit. Mounts directly onto regulator inlet. High performance filteration capability with replaceable filter. Resin impregnated cellulose element rated at 40 micron nominal. Bonded ceramic magnet traps fine metallic particles. Ambient temp rating -40°F to +250°F. Rated for fuel, air, and other media. Superior quality construction, corrosion resistant - solid brass, plated steel, and anodized aluminum. Every unit 100% tested for low/high pressure leaks and dielectric breakdown. Easy installation - 1/4"" male pipe outlet.